In interviewing Gary Johnson, the Libertarian candidate for President, I was following the advice of Ron Paul, who recently stated, "[Gary Johnson] is wonderful, and I think he's doing a good job, and I think people should look at him, and every individual should make up their own mind." A curious thing about Johnson's candidacy is that if you are not a libertarian - but you are liberal who believes in basic civil rights, the right to due process, personal privacy, an unregulated Internet, a peaceful foreign policy and an end to crony corporatism and pro-wall street policy making and marriage equality, for example, then Johnson - not Obama - is much closer to you on policy, but you'll probably vote for Obama. Similarly, if you are a conservative who believes in the Constitution, small government, free markets, balanced budgets and the Fed out of huge areas of your personal and economic life that could be better handled by yourself or even the States, then Johnson - not Romney - is much closer to you on policy, but you'll probably vote for Romney. If you do vote for Romney or Obama, you probably have no clue who Gary Johnson is. For that reason, the people Johnson really needs to win over in the last day or two of the campaign are those who already know that they are libertarian, and know very well who Johnson is - but just aren't sure that Johnson is really libertarian enough. In my interview with Gov. Johnson, I therefore covered a number of issues that Johnson-skeptics in the liberty movement frequently raise. For example, is his Fair Tax really libertarian; why is marriage equality a Constitutionally protected right and, most importantly, is Johnson really a peaceful non-interventionist on foreign policy? It became clear very early on in our interview that it was going to be an enjoyable experience, and quite unlike most interviews I have ever seen with a presidential candidate or equivalent. I began with the topic of marriage equality - one of his major issues. After some time on it, I pushed him on a philosophical point about which he simply had not thought. Rather than return to a practiced statement of position or fluster or get respond to a question that was not quite what I asked, he simply said, "You are the first person to have ever said this to me... and I'm going to have to roll that around a little bit." From someone who has been a politician at the national level for eight years (a two-term Governor of a state), that combination of humility and self-assuredness was refreshing and very human. And for the rest of the interview, I was similarly finding out as much about the man as his politics. It's Not What You Believe. It's What You Achieve. Johnson is not a purist. He is a pragmatist, and he says as much - often. As he says, "I think libertarians need somebody who can articulate getting from A to Z. But you know, if G is achievable, how about it? Let's get there!" As an example, he recalled that in one of the Republican debates, the candidates were asked if they were accept 90% cut in deficit for 10% revenue increase and every single Republican said they would not. Johnson, who was not at that debate, was shouting at the TV screen: "Yes. Of course I'd accept that. You're talking about a 90% reduction in the deficit and a 10% revenue enhancement. Come on." Whereas some hard-line libertarians bristle at the slippery slope that such concessions at first glance represent, no such deal actually precludes further revenue reductions later on. Johnson is truly committed to the abolition of income and corporate taxes; he just realizes that being committed to a particular destination doesn't preclude you from stopping along the way at places you don't really love. The important thing is always to be moving toward the destination rather than not moving at all (or moving backward). Johnson's policy positions are easy to find so I wanted to push on philosophical consistency on the one hand, and approach to governing on the other. Despite the fact that I was pointing out potentially serious problems with another one of his favorite issues, Johnson didn't do what most other politicians would do, which is to revert to a well-worn defense that may or may not answer the actual question asked. "I am advocating one federal consumption tax. We can certainly argue whether the prebate ... is the best way to deal with the fact that the federal consumption tax is regressive... Perhaps not. But back to the Fair Tax package. I think that it is a great starting point for what should be a debate and a discussion over how you make this happen in lieu of having the IRS and income tax and corporate tax." I offered a summary of his position: "What you'd say is that the upside in terms of for liberty of a consumption tax - for example the Fair Tax - is so great, but as a matter of principle, you're willing to concede the argument that says that there is some danger in having the entire population in receipt of a check - and that you would be open to discussing that?" His response was a simple and disarming, "Yes". Had I just inadvertently contributed to the development of the tax policy of a presidential candidate? Probably not, but I nevertheless had the sense of an unrecognized strength that Johnson brings to the table as a leader: whereas he obviously knows his stuff, he doesn't feel the need to have all the answers, and certainly no need to pretend to have them when he doesn't. He holds deeply held principles that determine where he is trying to go, but how we get there - and for Johnson, it is clearly always "we" - is invariably a matter for productive debate, which benefits from open minds. Based on these exchanges and myriad others throughout the interview, I began to see that what a few libertarians see as Gary Johnson's philosophical weakness is actually his political strength. It is not that Johnson is wishy-washy in his libertarian principles. Rather, he is very aware of, and comfortable with, the practical realities of doing politics with other reasonable people who may disagree on the preferred implementation of commonly held principles. Some political questions can be reasonably answered without reference to libertarian orthodoxies, such as the one I asked about the principles that would govern him in making legislative compromises, and together we summarized his answer as "common sense". I pressed Gary Johnson on foreign policy - the area in which some libertarians have most uneasiness about Johnson's purity. I asked, "There are some people who would be concerned that you would be more prepared to put our military in harm's way for what might be called humanitarian interventions than for example, Ron Paul, so could you please explain ... the principles based on which a humanitarian intervention [would be] not at odds with your principles of liberty. What are the principles that govern sending our troops into harm's way when we're not threatened? What are the rules? I liked his answer: not only did it not compromise anything sacred for me, but would play almost as well in a group of Republicans or Democrats as in a room of libertarians. "No humanitarian wars. That is an oxymoron. There would have to be Congressional approval for any time the military is used. Look... Never say never.... I don't want to say that if a genocide is occurring somewhere - and it is a situation that we could step in and alter - that we shouldn't do that. ... I can't give you a definition of genocide but I would like to think that if I saw it, I would know what it was. I think that none of us want to stand by and watch some dictator in another country line up 2000 people at noon and shoot every day them in the head in a five minute time frame. That to me would be an intervention that could be stopped ... and I hate to define anything at all ... but it could exist and I don't want to [say] "never". Again, I pressed further. Would participation by members of the military be voluntary? He answered affirmatively. Johnson's campaign is promoting the idea that 5% of the vote is a game-changer for U.S. politics. I asked him to explain. At 5% of the popular vote, ballot access issues go away for the Libertarian Party. Ballot access alone currently consumes most the party's time and money. The 5% vote also releases federal matching funds. Johnson explains just how important that could be: the LP is confident that they will achieve a vote close to their 5% target, and they will do so having spent two million dollars. In contrast, Romney and Obama will have spent two billion dollars. That's one tenth of the main party votes for 1/1000th of their spending. The electoral bang for the Libertarian buck is hugely greater than that achieved by either the Republicans or the Democrats. With that ROI, the five to seven million dollars in matching funds that would follow a 5% showing on Tuesday - no longer having to be spent on ballot access - could be one of the greatest boosts that have happened to the liberty movement in a long, long time. Ron Paul always said that the movement was not about him: it was about the message. The matching funds and the size of the libertarian "market" implied by a large enough vote to deliver those funds provide the easiest way to put Ron Paul's views on the stage in the presidential debates in 2016. That is primetime. That is breakout. That is, finally, the televising of the rEVOLution. When Americans see a three-way debate with the likes of a Johnson or a Paul in 2016, we won't have to struggle to tell them that they have been victims of a cruel illusion. The supposed difference between the Republicans and Democrats will be shown up for the illusion it is by the glaring contrast that the liberty candidate will so clearly offer. That is the liberty's movement most powerful weapon if only it can be fired. There is a greater difference between the end of the two party system and its continuation than there is between an Obama presidency and a Romney presidency. A choice between two things that are the same is no choice at all. Much nonsense is written about "wasted votes". By any accurate definition, a wasted vote would be one that, even if repeated indefinitely, could change nothing of substance. A vote for the duopoly, whether you prefer Obama flavor or Romney flavor, would be such a vote. When you see that, you see that the only way not to waste one's vote is to vote to break the duopoly, which means to vote for Gary Johnson. To the segment of hardline Ron Paul loyalists who believe that Johnson should not be trusted to implement libertarian orthodoxy all of the time, I suggest you've got exactly the wrong end of the stick. It is precisely because he is not an ideologue - but an idealist with his feet on the ground - that he can do more to set up a big tent of liberty (and size does matter in a democracy) than those who think that any deviation from their own understanding necessarily represents a philosophical falling short. I am not so surprised that I have been able to write positive things about Johnson's politics. But I was not expecting to write such positive things about his character - and they may mean even more. Johnson is an easy-going guy who is not in his own way. I had never spoken to him before, but our interview, conducted over 2000 miles and a Skype connection, felt more like a decent conversation with a friend over tea, sharing our views of the world and perhaps even learning a few things from each other. Of Blue Republicans - former Independents and Democrats who registered Republican specifically to support Ron Paul - 79% of those who have already voted have voted for Johnson. I had planned not to endorse any Presidential candidate who was not Ron Paul, and I have a deep respect for the 15% of Blue Republicans who have decided to write in his name - especially if they are doing so in a state where those votes will be counted. But the truth is that the Blue Republican movement has already endorsed some wonderful candidates around the country. And a vote for Gary Johnson has the potential to do at least as much good for American liberty as a vote for any one of them. I believe the majority of Blue Republicans have it right. 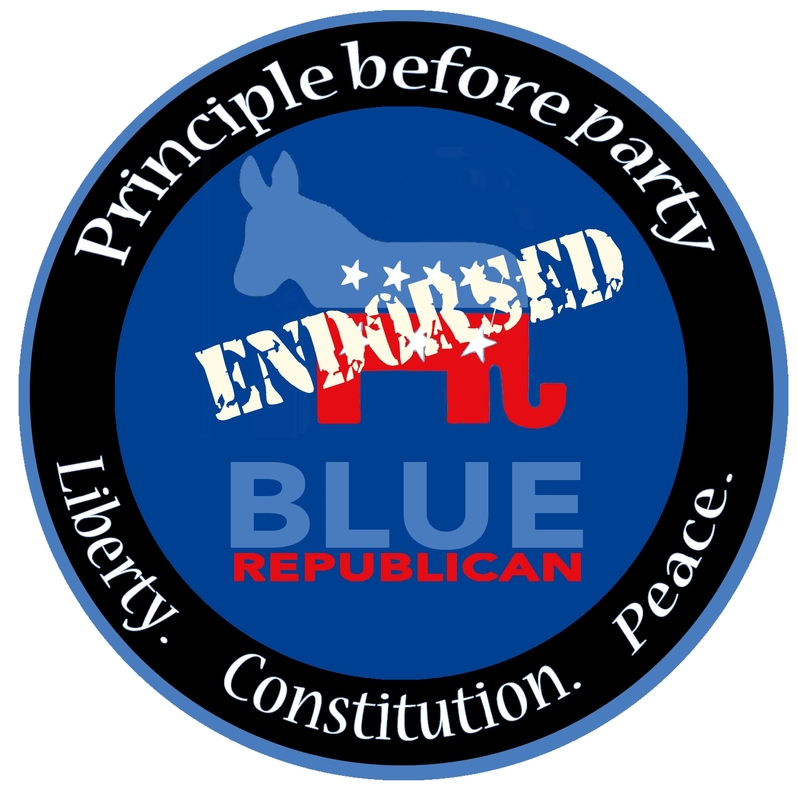 Herewith, then, the Blue Republicans give their official endorsement of Gary Johnson for President. Not only is he a lover of liberty: he brings a humility, pragmatism and approachability to our movement of which we need more - not less - if we are to achieve the lofty goals we have set for ourselves. Just put on your Ron Paul T-shirt when you go to vote for him - - but hide it under your jacket so as not to violate any voting regulations. And most importantly of all, Never Say Never.